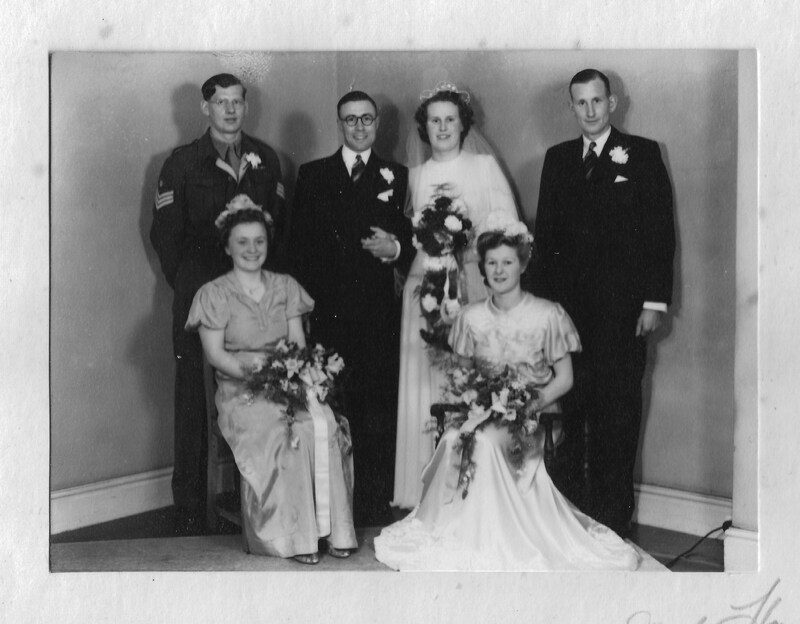 We have been looking at The War Years of Nancy Dora Dinnis, and here is a little postscript to her story. 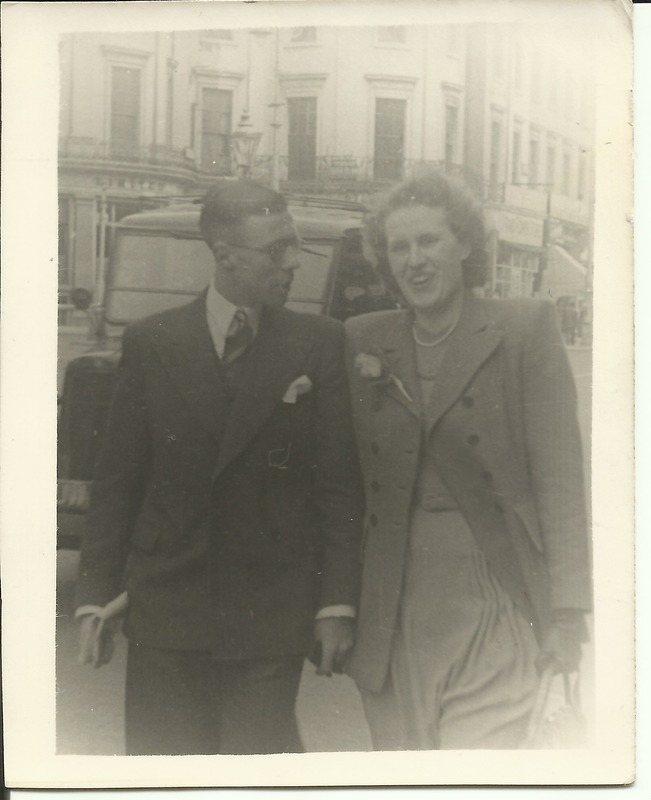 Nancy met Bert (Joseph Herbert Arkell) at the start of World War 2 and shortly after this he was posted to Egypt. He asked Nancy to wait for him until his return. She agreed, and waited for five years. 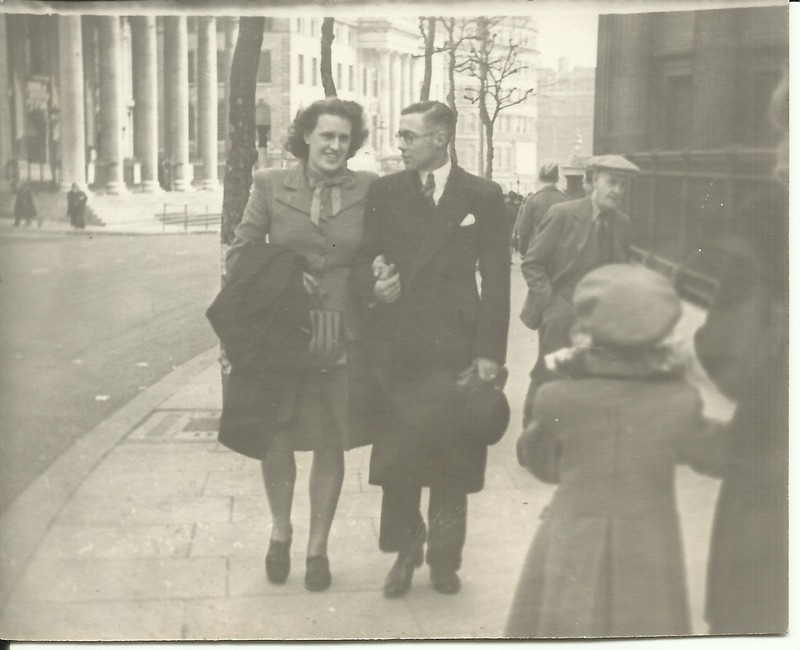 They married at Dorset Gardens Methodist Church in Brighton on the 26th of April 1947. Mr. Joseph Herbert Arkell and his bride, Miss Nancy Dora Dinnis, leaving the Dorset gardens Methodist Church, Brighton, after their marriage on Saturday. Friends filled Dorset gardens Methodist Church, Brighton, on Saturday, for the wedding of Mr. Joseph Herbert Arkell, son of Mr. and Mrs. Arkell, of 19 Victoria Terrace, Lancing, and Miss Nancy Dora Dinnis, daughter of Mr. and Mrs. J.T. Dinnis, of 38 Blaker Street, Brighton. The bridegroom is a former R.E.M.E. staff sergeant who served overseas for almost five years, while the bride a member of Dorset-gardens Church and Social Club, was a Junior Commander with the A.T.S. during the war. Given away by her brother, Mr. Jack Dinnis, the bride looked charming in a gown of white crepe with a bridal headdress. She carried a shower bouquet of deep red carnations. The bridesmaids were Miss Joan Wilson, a friend of the bride, who wore a gown of pale pink satin with a feathered headdress, and Miss June Hillborn, cousin of the bridegroom, who wore a similar ensemble of blue satin. Each carried a shower bouquet of spring flowers. The duties of best man were undertaken by S./Sergeant Gordon Dinnis another brother of the bride, and the service was conducted by the Rev. George E. Tarr. The reception was held at The Savoy, Brighton, and the honeymoon is being spent in the Lake District. Brighton station, wedding guests seeing off the newly married couple, leaving for their honeymoon. 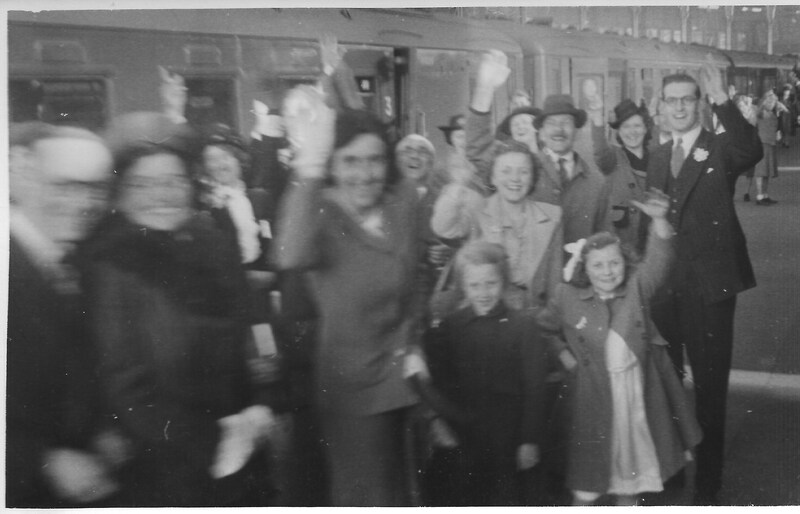 Wedding guests waving goodbye to Bert and Nancy as they leave for their honeymoon from Brighton station. 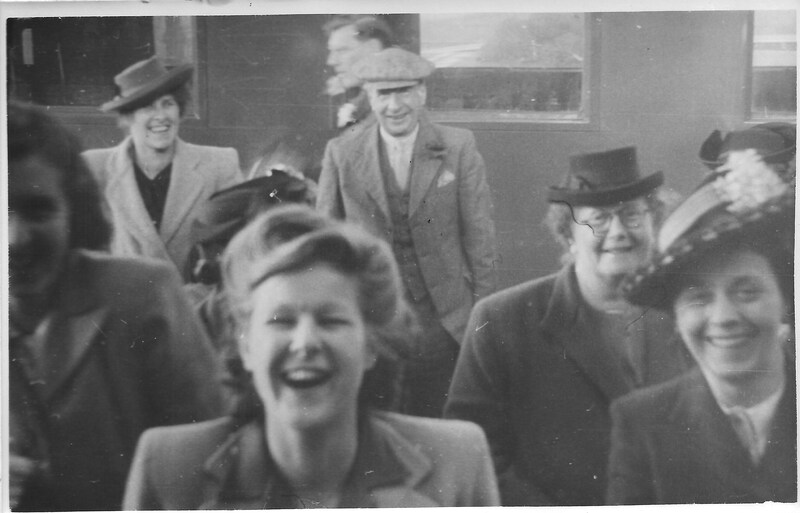 You can make out Nancy’s brother, Ron on the right, and behind him you can see Enid May Howells – my mother. 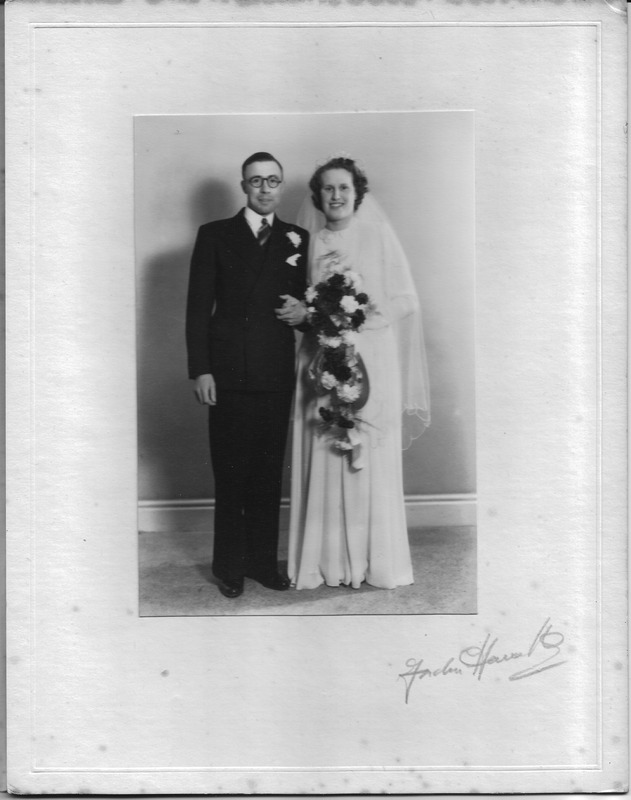 This entry was posted in Nancy Dora Dinnis, World War 2 and tagged Brighton Railway Station, Dorset Gardens Methodist Church, honeymoon, Joseph Herbert Arkell, London, shower bouquet, wartime romance, Wedding. Bookmark the permalink. Thanks Sue, I couldn’t have done it without all the photographs and documents you brought over. I’m so glad you have so much, it really helps in telling her story. Your mum was so special and it is a pleasure to write about her. So wonderful that you have such great photographs to illustrate the story, especially the candid ones from the train station. Thank you, I’m so glad my cousin kept so much from the past. I love finding old photographs of my family, it brings the history to life.